Tanintharyi, Myanmar’s southern-most state, is home to the country’s last remaining old-growth mangrove forest. The trees support village life and a booming fishing industry up and down the coast. But logging for charcoal and fuel wood, much of it illegal, is taking a toll. Studies show that roughly two-thirds of the region’s remaining mangrove forests have been degraded, with consequences for people and wildlife. Conservationists are attempting to expand community forestry and set up mangrove reserves to combat the widespread degradation. TANINTHARYI, Myanmar — When viewed from the bow of a boat, the shoreline near the city of Myeik in southern Myanmar is all green. In every direction, low-slung mangroves blanket the horizon, their trunks submerged under several feet of water at high tide. The trees anchor a sprawling landscape that supports village life and a booming fishing industry up and down the shoreline of Tanintharyi, Myanmar’s southernmost state. But in many places, what appears green and lush from a distance disguises a landscape in peril. Christoph Zockler, an ornithologist with the German foundation Manfred-Hermsen-Stiftung for Nature Conservation and Environmental Protection, has seen this up close. He first traveled through this labyrinth of coastal islands and mudflats in 2013 in search of shorebirds. 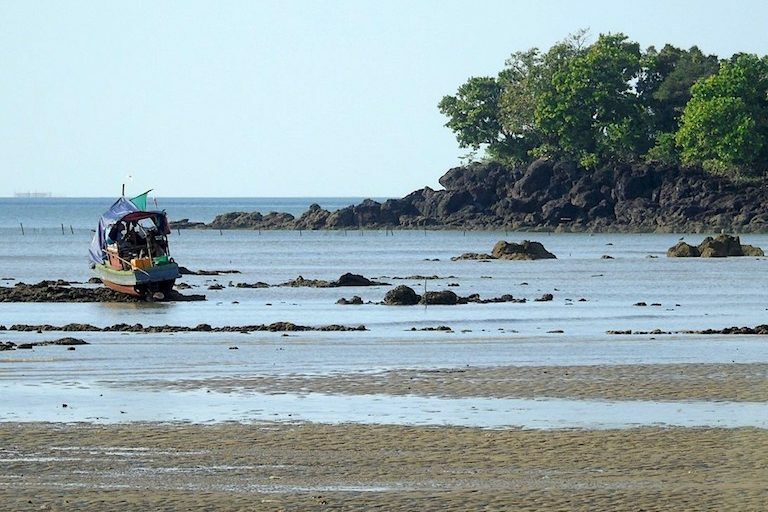 In November of 2016, in collaboration with the U.K.-based NGO Fauna and Flora International (FFI), Zockler and a team of researchers from Myeik launched a 12-day expedition of coastal Tanintharyi by boat, sleeping on board and, when the tides allowed, camping on shore. The team cataloged otters, dolphins, vast swarms of crabs at low tide, a wide variety of fish and more than 200 species of birds, including the critically endangered spoon-billed sandpiper (Calidris pygmaea), of which no more than 600 likely remain on Earth. But among the marine wildlife and endangered bird sightings, the team also observed human activity that is putting the future of the mangroves in jeopardy. At 16 of the 20 locations they visited, they witnessed logging with chainsaws: large old-growth trees chopped at the base; boats stacked high with logs destined for the furnaces of factories in Myeik, other cities in Myanmar, and even Thailand. In many cases, only saplings were left behind. Data source: Hansen/UMD/Google/USGS/NASA, accessed through Global Forest Watch. Satellite imagery from Planet Labs. According to data from the University of Maryland, the municipality of Myeik lost around 16 percent of its tree cover between 2001 and 2016 — mostly from mangroves. 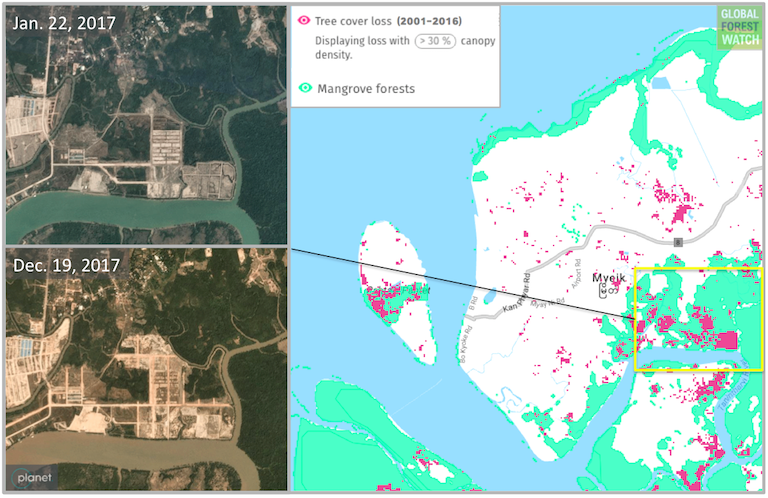 Satellite images from the San Francisco-based company Planet Labs show that mangrove deforestation continued in 2017, particularly in the southeastern portion of the region. However, other research shows that that kind of outright forest loss is actually less common in the area than low-grade forest degradation, which happens when larger, more valuable trees are cut from a forest but smaller trees are left behind. Forest degradation can be subtle and hard to detect. In an unpublished 2016 study, Anna Stephani, a graduate student at the University of Bayreuth in Germany, and several colleagues used satellite images to examine degrees of mangrove loss in the area around Myeik and further south. They characterized just 22 percent of the forest as “intact to slightly degraded,” a category that consisted of old-growth forest that was either untouched or logged lightly enough that it could still regenerate easily. A full 45 percent of the remaining forest she classified as “degraded,” and 18 percent as “heavily degraded.” Another study, conducted across the entirety of Tanintharyi by a team from FFI and the U.S.-based Smithsonian Conservation Biology Institute, found that 66 percent of the region’s mangroves were degraded and just 34 percent remained intact. The level of deforestation has conservationists concerned that Tanintharyi’s mangroves could soon meet the same fate as those of the Irrawaddy Delta, a vast, populous area to the north where human activity has decimated once plentiful mangroves. Located near Myanmar’s largest city, Yangon, the delta has lost more than 80 percent of its mangroves over the past three decades. The destruction has been so widespread that international organizations are considering a plan to replant mangroves throughout the delta using drones. The forests that remain are severely degraded, said Zockler. The effects of the loss on people have been tremendous, highlighted by Cyclone Nargis, which plowed through the low-lying delta in 2008 and killed 140,000 people. Had more of the mangrove forest been preserved, experts believe thousands of deaths could have been prevented. Mangroves near Kan Maw Island, Tanintharyi, Myanmar. Photo by Christoph Zockler. Today, Tanintharyi has more remaining and ecologically healthy mangrove forests than the Irrawaddy Delta, Zockler said. But some of the same pressures that wreaked havoc there — growth in shrimp farming, rice cultivation and charcoal harvesting — are ramping up here. And that spells trouble for marine wildlife and the local communities it sustains. Healthy mangroves serve as fish nurseries, helping to buoy the region’s fishing industry. On Zockler’s recent expedition and in surveys conducted by FFI and the Tanintharyi-based conservation group Green Network, locals reported that wood-cutting had accelerated in the past five years, due in large part to the import of cheap chainsaws from China. The wood is used to feed demand for charcoal in Myanmar and Thailand and to fuel fish-drying factories in Myeik. In many of the villages that dot the Tanintharyi coast, mangroves remain a central part of life and are put to a much wider variety of uses. In Ma San Par, a fishing village tucked inside the treed waterways of an island near Myeik, 24-year-old Zaw Ko Oo putters his boat away from town each day before high tide to set crab traps deep in the submerged forest. He has been fishing this way since he was 4 years old, when he would accompany his grandmother into the mangroves with crab traps made of bamboo. Nearly every family in town survives on marine life supported by the mangroves, either within the forest or farther out to sea. They mend boats with wood planks carved from mangrove trees. They build their homes above the shoreline, elevated on sawed-off mangrove trunks. They cook meals over fires that burn with charcoal made from mangroves. When storms come, the same trees serve as a bulwark, for which the people of the village are grateful. “The mangroves protect us from the outside wind and waves,” Oo said. Village life continues in this way up and down the Tanintharyi coast. But it is not always by choice that communities turn to mangrove clearing, said Oo and others in his village. In places where fishing has become more difficult, people harvest mangroves to sell because they have few other options. Large, healthy mangrove trees still stand in the Myeik archipelago of southern Myanmar, although many have been cut for charcoal production. Photo by Christoph Zockler. 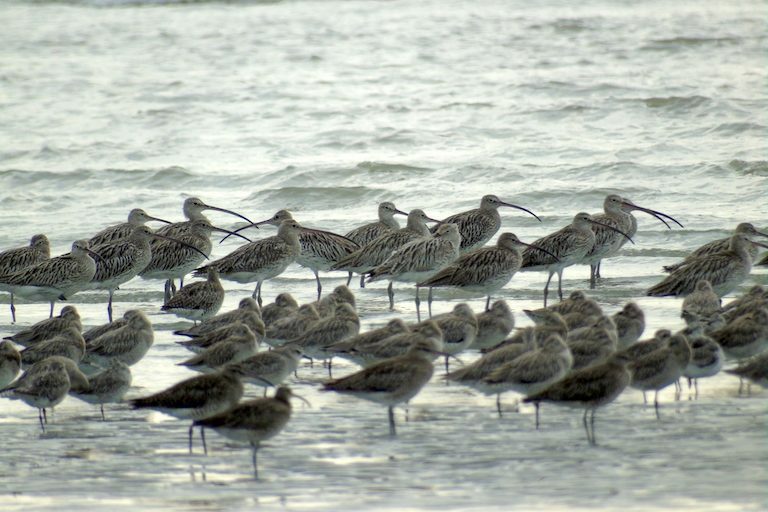 A 2016 research expedition found more than 1,400 Eurasian curlews (Numenius arquata) wintering about 80 miles south of the city of Myeik in Myanmar's southern state of Tanintharyi. Photo by Christoph Zockler. Millions of mud crabs make their homes in the mudflats near Kan Maw Island, about 40 miles south of the city of Myeik in southern Myanmar. Photo by Christoph Zockler. 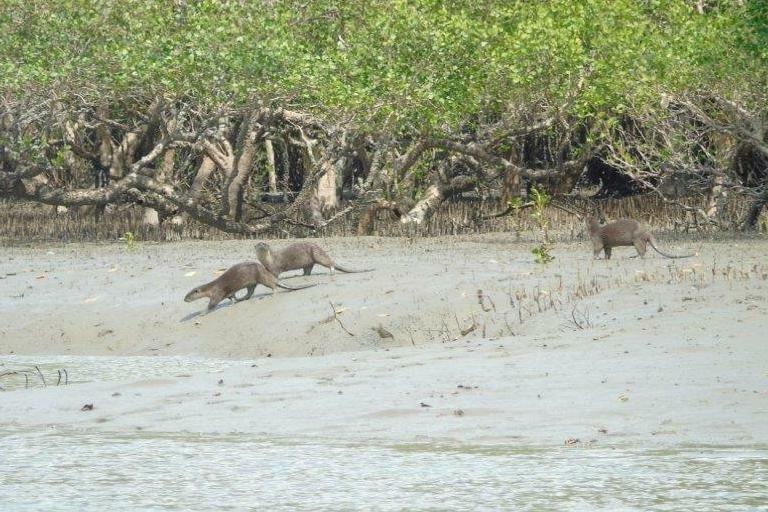 Smooth-coated otters (Lutrogale perspicillata) still live in good numbers in the mudflats and mangroves of Kan Maw Island, Tanintharyi, Myanmar. The IUCN classifies the species as vulnerable. Photo by Christoph Zockler. 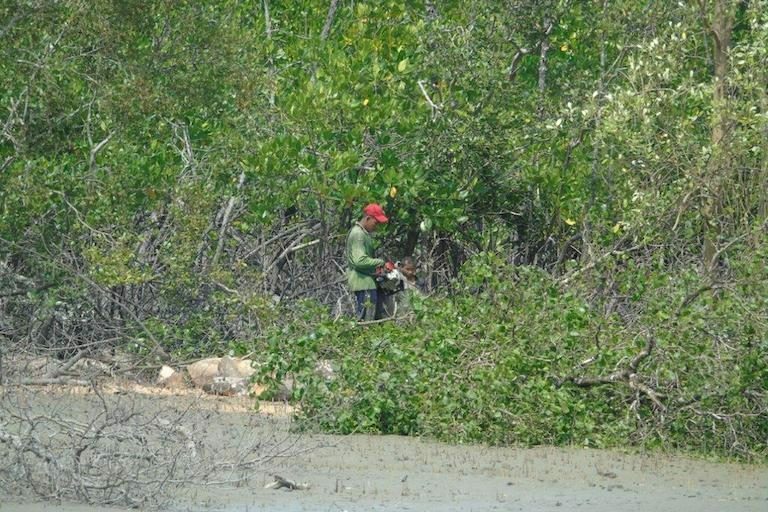 A man cutting mangroves. Mangrove cutting has accelerated in recent years. Some locals attribute this to the import of cheap Chinese chainsaws. Photo by Christoph Zockler. 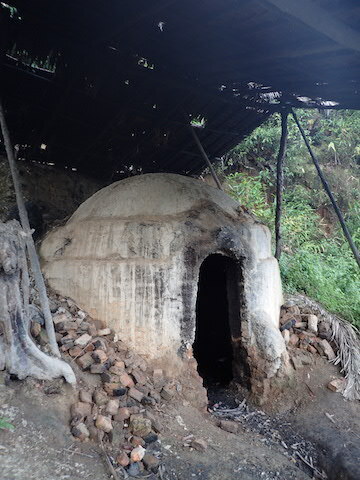 A village charcoal kiln in Myeik. Photo by Mark Grindley/FFI. 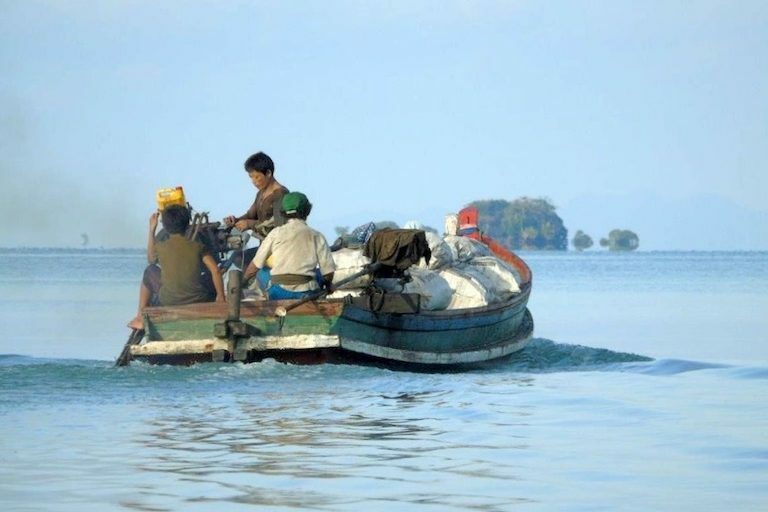 Transporting charcoal made from mangroves in the Myeik Archipelago. Photo by Christoph Zockler. 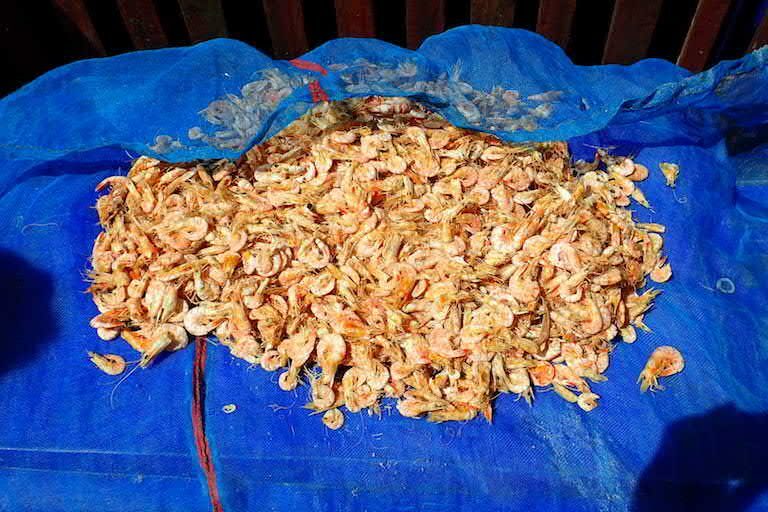 Shrimps drying in the sun in Myeik district, southern Myanmar. In mangrove villages, net mesh sizes are constantly reducing as returns diminish. Photo by Mark Grindley/FFI. Fruits of the sea and mangroves. 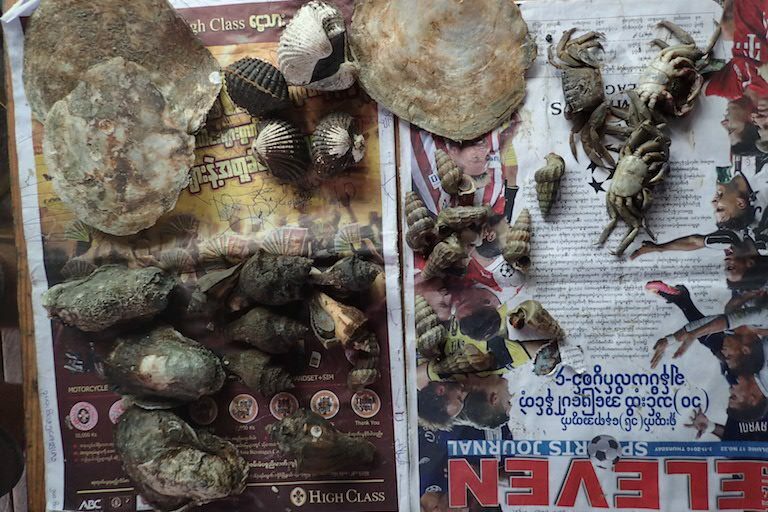 Residents of Myeik mangrove villages harvest cockles, clams, oysters and other shellfish, mostly for household consumption. Photo by Mark Grindley/FFI. 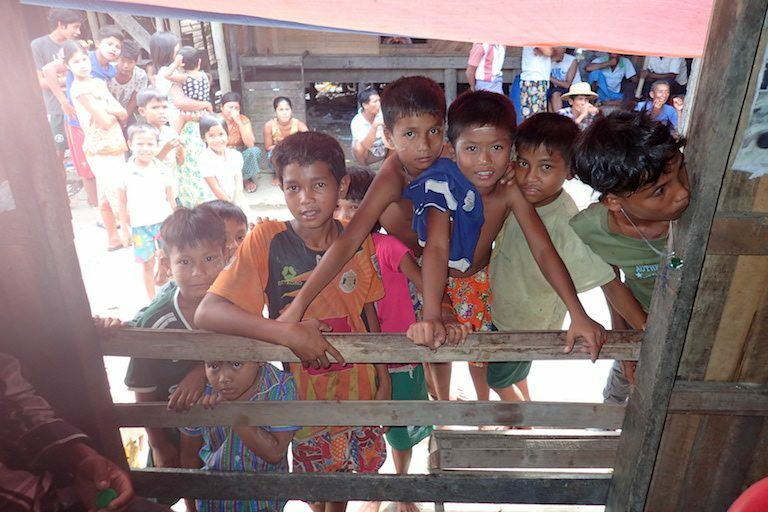 Local children come to watch staff of the U.K.-based NGO Fauna and Flora International discuss mangrove conservation with village leaders in Myeik, Myanmar. Photo by Mark Grindley/FFI. A mangrove forest community in Myeik. Conservationists are assisting several communities along the southern Tanintharyi coast to gain the skills and rights to manage their own mangroves sustainably, under government community forestry certificates. Photo by Mark Grindley/FFI. A survey boat used in a 2016 research expedition at low tide. Photo by Christoph Zockler. 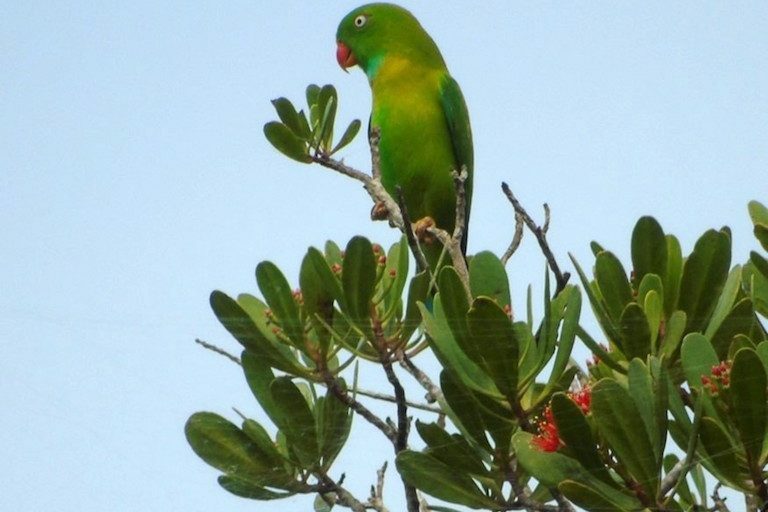 A vernal hanging parrot (Loriculus vernalis) feeds in a flowering Lumnitzera racemosa mangrove tree. Photo by Christoph Zockler. Plovers (species unknown) and Terek sandpipers (Xenus cinereus) roost in mangrove trees at high tide. Photo by Stefan Pfützke. Many in the region say the process was jump-started by businessmen who first penetrated the area nearly two decades ago. Today, charcoal kilns operate even in small villages, supported by investments from outsiders, according to researchers from Green Network. Charcoal from the highest-quality mangrove species is shipped abroad. Lower-grade trees are consumed domestically. Across the board, villagers report that the biggest trees are now gone from the landscape. Much of the charcoal harvesting is illegal, according to conservationists. Myanmar’s new government, ushered into power just two years ago in the country’s first democratic election in more than three decades, has attempted to ramp up enforcement in Tanintharyi, but it has been difficult because the trade is widespread across a vast territory, and charcoal exports have become a big business for the country. The region has just one formally protected area that contains mangroves: a national park on a remote island. The country as a whole has a similar problem: mangroves are underrepresented throughout Myanmar’s protected area system. Several mangrove forests in Tanintharyi are proposed for protection, but nothing has been finalized. The sun sets on the coastal islands and mangroves near the town of Bokpyin, about 80 miles south of Myeik. Photo by Christoph Zockler. FFI and Green Network have also begun a pilot program to help curb demand by introducing fuel-efficient wood stoves and subsidizing people who switch to gas burners, but the programs are still small at this point. 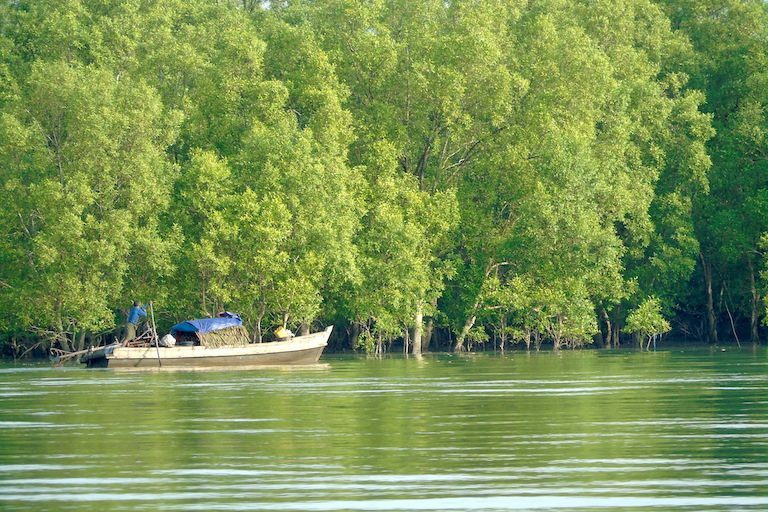 In the meantime, Myeik University marine science professor Nang Mya Han has undertaken a study of the carbon-storage capabilities of Tanintharyi’s mangroves, with the hopes of one day being able to sell carbon credits to other countries. In addition to working as storm buffers and combating erosion from rising sea levels, mangroves are also better at storing carbon dioxide than almost any other kind of tree, making them valuable in the fight against the rise of global temperatures. “Mangroves and climate change are intimately linked together,” Han said. 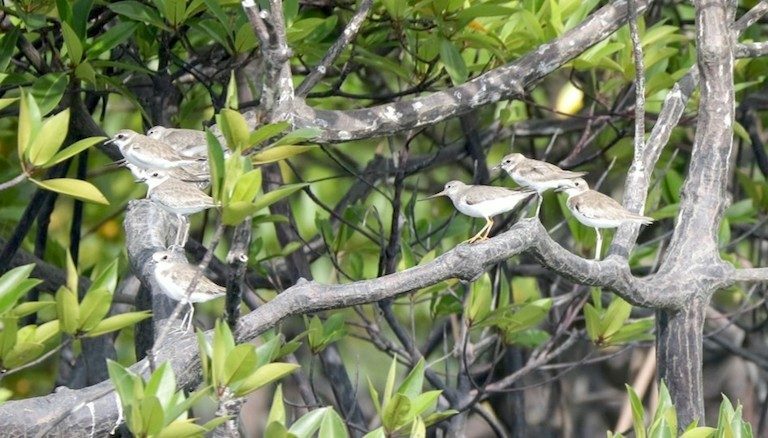 Just outside of the Myeik city limits, Han has her own pet project that she hopes will help with future conservation efforts on the Tanintharyi coast: a 324-hectare (800-acre) plot of mangroves, allocated to her supervision by former president Thein Sein. She envisions turning it into an academic reserve planted with a variety of mangrove species native to Myanmar that would allow students and researchers to study the country’s mangroves all in one place. But even her reserve isn’t immune to the pressures facing Tanintharyi’s mangroves. Nearby brick factories have been covertly entering the forest and chopping down trees to fire their kilns, she said. Inside the reserve, the hacked-off trunks of harvested mangroves are visible. From the outside, the mangroves look lush and green. 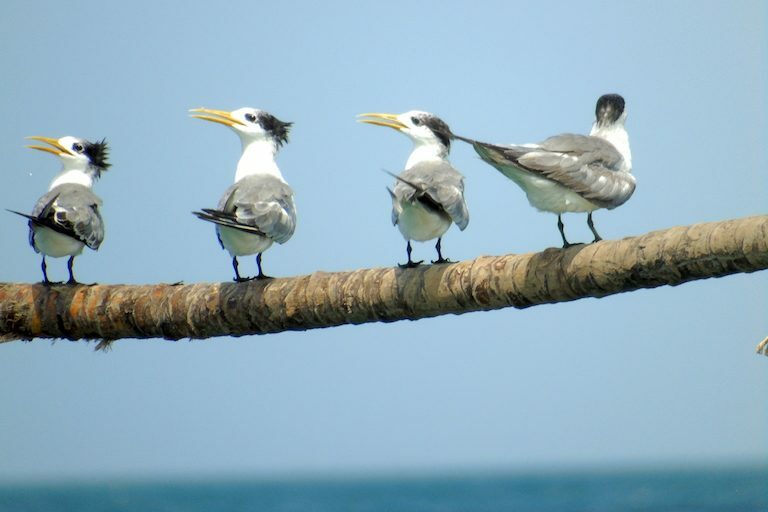 Greater crested terns (Thalasseus bergii) winter in the Myeik Archipelago. Photo by Christoph Zockler. Connette, G., Oswald, P., Songer, M., Leimgruber, P. (2016). Mapping Distinct Forest Types Improves Overall Forest Identification Based on Multi-Spectral Landsat Imagery for Myanmar’s Tanintharyi Region. Remote Sensing 8:882. Banner image: A boat load of cut mangroves. High-quality charcoal made from mangroves is exported to Thailand. Photo by Christoph Zockler. Benjamin Graham is a journalist living in North Carolina. He writes about conservation, politics and birds.